I decided that it was time for another in the Asgardian series. 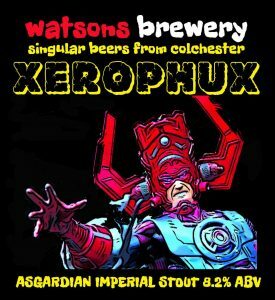 XEROPHUX is an imperial stout. You can see from the label he’s a dude with attitude, and this became obvious as he sat in the fermenter fermenting away much longer than your normal beers. Bottles only, available January 2019. Image photoshopped from an original photograph by Pat Loika which was made available under Creative Commons Attribution 2.0 Generic (CC BY 2.0).